More than 80% of tap water samples collected worldwide tested positive for microplastics. That’s the conclusion of a unique global scientific study on the overwhelming prevalence of microplastics – ultra small pieces (less than 5 mm) of plastic debris resulting from the disposal and breakdown of consumer products and industrial waste. “Our exclusive research found 83% of the tap water samples from 14 countries are contaminated with microscopic plastic fibres”, said Molly Bingham, founder and CEO, Orb Media, a US based non-profit digital media outlet. The tap water study, was designed by Dr. Sherri Mason a microplastic expert at the State University of New York at Fredonia, and Elizabeth Wattenberg at the University of Minnesota, School of Public Health. » A new international study has found microplastics in tap water samples from around the world. » 83% of the tap water samples from 14 countries are contaminated with microscopic plastic fibres with the US having the highest rate of contamination. » Currently, there are no regulations concerning the levels of microplastics in fresh water supplies. In all they screened 159 half litre drinking water samples from 14 countries: Cuba, Ecuador, France, Germany, India, Indonesia, Ireland, Italy, Lebanon, Slovakia, Switzerland, Uganda the UK, and the US. Samples were taken from a variety of places including the government buildings in the US, the exclusive Sloane Club in London, a private apartment in Beirut, a household tap in Slovakia and a public spigot on the shores of Lake Victoria in Uganda. Results showed that the contamination of tap water samples was distributed evenly across the globe. The US had the highest contamination rate, at 94% of samples tested, with plastic fibres found in tap water sampled at sites including Congress buildings, the US Environmental Protection Agency’s headquarters, and Trump Grille in New York. Lebanon and India had the next highest rates. European nations including the UK, Germany and France had the lowest contamination rate. However ‘low’ is a relative term since around 72% of samples from these countries were found to be contaminated. The average number of fibres found in each sample ranged from 4.8 in the US to 1.9 in Europe. The full story of the investigation, Invisibles: The Plastics Inside Us, can be read here. 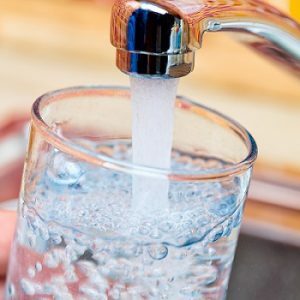 Earlier this year a study conducted by the US EPA sampled freshwater supplies in the Republic of Ireland and found worrying levels of contamination in tap water and well samples there. Results showed that microplastics could pass through a public water supply filtration system meaning these non-biodegradable micro-particles can end up in rivers and oceans, potentially entering the food chain. Accidental ingestion of water containing microplastics through bathing. The study also identified 24 different species of molluscs, fish, birds, mammals and crustaceans, as being potentially at risk from microplastic pollution in Ireland, many of which are classified as endangered or vulnerable. “In addition to microbeads washed into the sewer from the use of personal care products, synthetic fibres from clothing transported in washing machine wastewater are another significant contributor of microplastics found in urban wastewater treatment plants”, said lead researcher Dr Anne Marie Mahon of the Marine and Freshwater Research Centre at Galway Mayo Institute of Technology (GMIT). A cleaner, greener home – without chemicals!